Green tour Kyoto | travel information in JAPAN » Blog Archive » Invitation tickets of museums! Why don’t you escape to the air-conditioned museums and appreciate the arts? 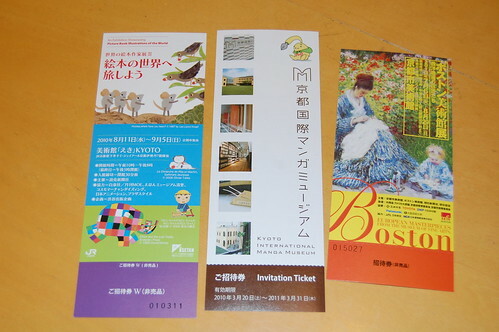 Lucky free tickets of nice museums in Kyoto are available at c.coquet! Western paintings of Boston museum at Kyoto Municipal Museum? or Manga Museum? or Picture book exhibition at Museum EKI Kyoto next to Kyoto Station? For the detail of the exhibition, please check GTK website “Art & Performances” ! Please stop by c.coquet and pick them up!